There are really no over-the counter home remedies for bladder infection in cats, but there are some products that have shown the ability to provide support at least until the cat can see the vet. Before even trying anything at home, owners of male cats must understand that because of a male cat’s conformation, things can go downhill very quickly should the cat be unable to urinate. If you have a male cat with a urinary tract infection, please see your vet as soon as you can to prevent any complications. Male cats have a very narrow urethra which can easily be blocked by a plug of mucus, crystals and tiny bladder stones, explains veterinarian Wendy C. Brooks. Blocked by the plug, the cat is unable to urinate so the bladder fills up with urine causing a distended bladder. Unable to urinate, toxins accumulate in the cat’s body which leads to vomiting, nausea, loss of appetite and eventually death. If your male cat is straining to urinate, has bloody urine, play it safe and see your vet immediately before complications set in. After only 24 hours, toxins will already start accumulating in the cat’s body and things go downhill from there. The following home remedies are therefore for mild cases only and definitively not for blocked cats. Blocked cats will only get better once the vet inserts a catheter up their urethra to unblock the plug with the cat sedated as the procedure is very painful. In the next paragraphs, we will see traditional treatment and home remedies for cat bladder infections. Normally, your cat will see the vet and your vet will collect a urine sample. If your cat has seen the vet recently for a urinary tract infection or if your cat is particularly fractious at the vet’s office, your vet may skip the vet visit and just ask you to drop off a urine sample. What’ the price of a cat urinalysis? A cat’ urinalysis usually costs between 30 and 50 dollars. Collecting a urine sample from a cat may seem like a daunting task, but can turn fairly easy if you substitute your cat’s litter with lentil beans or Styrofoam packing peanuts. These products won’t absorb the urine so it’ll be easy to collect when you tilt the litter box. Alternatively, vets may sell a special litter that doesn’t absorb the urine. When you collect the sample, make sure it’s very fresh (less than 12 hours old) and stored in a sterile container with no soap residues. Keep it refrigerated until it’s time to take it to the vet. Not always does straining in the litter box indicate a cat bladder infection. The same symptoms can be seen in cats suffering from crystals in their urine or feline idiopathic cystitis. By providing a urine sample, your vet can rule out other medical causes of urinary problems that may resemble the symptoms of a urinary tract infection. Urinary tract infections in cats are diagnosed when bacteria are found in a cat’s urine sample. A culture test will help individualize the exact bacteria. Note: If your cat is prone to to feline idiopathic cystitis, read home remedies for feline idiopathic cystitis. Feline idiopathic cystitis is a condition that is diagnosed by exclusion, only after testing the cat for a bladder infection or presence of crystals or stones. Once the vet confirms a bladder infection, the drugs of choice to treat urinary tract infections in cats are usually broad spectrum antibiotics such as Clavamox or Amoxicillin which are generally given for 10 to 14 days. While stores selling antibiotics for fish and feed stores may supply such antibiotics over the counter, there may be some problems in doing this. One is that drugs should be given only under the guidance of a vet for correct dosage and duration, another problem is that your cat may not have a urinary tract infection at all, or if your cat does, not all antibiotics work well for a cat with a UTI. As mentioned, a urinalysis is the best course of action because it helps the vet determine what condition is affecting the cat and which bacteria are found in the urine, so he/she can select the most appropriate type of antibiotic. As mentioned, home remedies are mostly supportive for mild cases when you are waiting for your vet appointment or to prevent future occurrences of urinary tract infections. Definitively, they should not be used for advanced infections or blockages in male cats where every minute counts! Following are some home remedies for cat bladder infections. Can I give My Cat Cranberry Juice? When humans get a bladder infection, they often reach out for cranberry juice. Cranberry juice for bladder infection in cats can help acidify the urine and make the area less hospitable to bacteria, but the issue is convincing a cat to drink the juice! Many cats will not lap it up due to its acidic flavor. One method to is to disguise it by mixing it with some food or adding some to the water. Make sure you only offer unsweetened cranberry juice. Adding it to food may help. Can I Give my Cat Apple Cider Vinegar? There are many cat owners who report seeing results when they give their cats apple cider vinegar. According to VetInfo, in a study conducted by a holistic website, out of 43 owners of cats suffering from symptoms of urinary tract infection, 41 noticed a marked improvement, 1 owner noticed no improvement, and another one stated that there was an improvement, but the cat didn’t fully heal. As with the cranberry though the problem is cats are reluctant to consume it. Some cat owners add it to the cat’s water while others prefer to add it to their cat’s canned food. Holistic vets suggest to give 1/4 teaspoon twice a day. Can be given straight when mixed in the canned food, but will need to be diluted 50/50 with water if dropper fed. 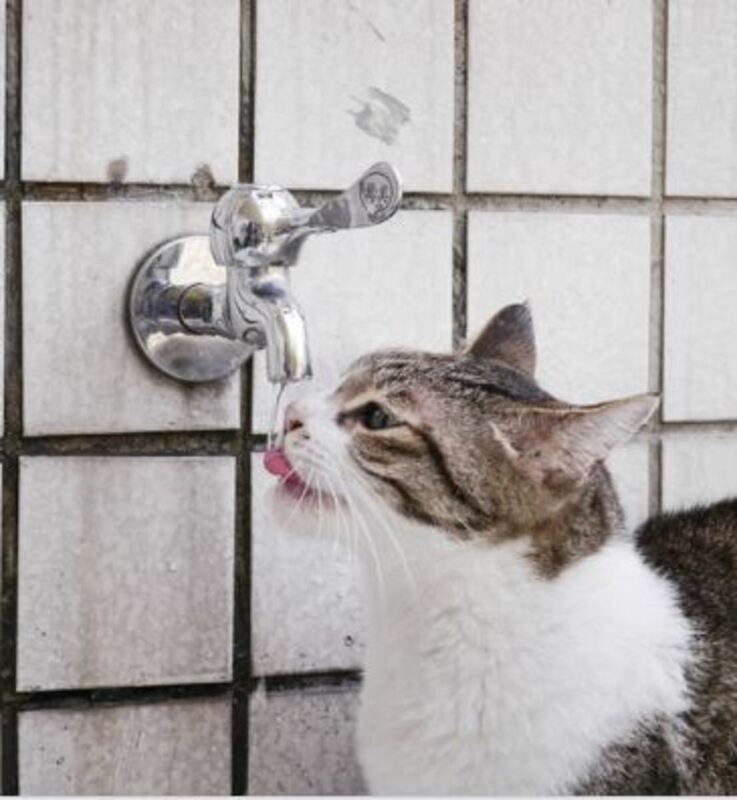 The more moisture a cat ingests, the less likely the urine concentrates which leads to build-up of bacteria and crystals. Many cat owners notice an improvement when they switch their cats from a dry food to canned. After all, cats weren’t really meant to eat dry kibble with low meat contents and full of carbs. When dry food is made, in order to keep its shape some sort of carb or starch must be used which is plant-based. The problem with this is that plant-based foods are less acidic while protein is more acidic. Cats with bladder problems need to have a more acidic pH. According to veterinarian Ron Hines, veterinarians like to see a slightly acidic pH in the range between 6 and 6.9. Consult with your holistic vet for a good quality canned food and make sure you don’t go cold turkey. Gradually switching the food over the course of a week can help prevent digestive upset. A better option than trying to get a cat to drink cranberry juice may be adding Uromaxx, a product made of cranberry extract to a cat’s diet, suggests veterinarian Dr. Fiona.This over-the-counter supplement is worth mentioning because of its good reviews. It’s made of the extract of cranberry, vitamin C and glucosamine which helps nourish the bladder. Uromaxx works well as preventive for future occurrences and according to veterinarian Dr Fiona, it reduces bacterial adhesion to the bladder wall. While only antibiotics may work to eradicate a bladder infection in cats, Methigel, an over-the-counter urinary acidifier may help as it makes the urine acidic and less hospitable to bacteria. Give a dose every 6 hours, suggests veterinarian Dr. Loretta, but consider that this is not curative, but supportive until the cat can be taken to the vet for antibiotics. Wow, I am so glad to see that the apple cider vinegar helped! My cat just started having problems urinating and I called the vet and naturally they wanted money up front. I used to have the absolute greatest vet ever! He would let me bring my pets in in emergency situations and would let me pay him monthly with no questions asked. Now that he has retired, I can’t find a vet anywhere that will let me make payments. People that are disabled or low income love our pets as family just like everyone else, and alot more animals would be homeless if only the rich could have pets. I wish there were more vets like Dr. Woods that cared more about the pets than the ability to”pay at visit in full”. I am going to give my baby the apple cider vinegar and water and pray for her healing. Living alone for the last eleven years, she is all I have. Thank you. I have 2 cats. One of them must have something going on because the urine smell is awful. I’ll give it a try and still go to the vet. They are due for a check up anyway. I’ll let you know how it works for me. I didn’t know what my cat has until I read the symptoms of a blast infection. My cat was dying and I used the Apple Cider and she started to urinate and drink water she also stated to feel much better. hooray for Apple Cider vinegar. About 9 or 10 years ago, my cat developed a bad bladder infection (very strong smell urine). The Vet took 2 X-rays of her and found that she had ‘stone’ in her bladder the size of about a quarter. He prescribed some antibiotics, but said that he would probably need to operate (which he said would cost about $1000). Well, the antibiotics helped but the infection (smell) came back about 3 weeks later. The doctor gave me more antibiotics once again and they did seem to work for a little while, but on a whim, I started adding cod liver oil drops(4) per ‘Meow Mix’ wet food container ( I feed her about 1/3 of that container twice a day). Well, that was about 9 or 10 years ago, and I haven’t had to take her back to the vet and she hasn’t had a smelly urine again since then, which I assume means the stone went away, and there has no further bladder infection. I hope this can work for you if you have an animal with a bladder infection.